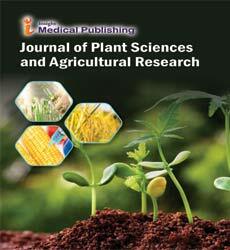 Journal of Plant Sciences and Agricultural Research is a new peer reviewed, international journal, with world famous scientists on the editorial board. Journal of Plant Sciences and Agricultural Research is a open access journal with rapid publication of articles in all fields and areas of biotechnology dealing with plants. Plant Biotechnology: Applied plant science, plant biology, plant tissue culture (PTC), in vitro mass propagation, metabolic engineering, cell biology, virus elimination and organogenesis, regeneration, somatic embryogenesis, secondary metabolites. Agricultural Biotechnology: Plant breeding, transgenic crops, modified crops, crop safety, marker assisted breeding, field-testing. Genetic Engineering: Analysis of gene and gene function, genome, proteome, gene networks, metabolic engineering, gene silencing, gene expression, gene and genome analysis, comparative genomics, physiological studies, developmental studies, molecular screening technologies(MST’s), bioinformatics and their applications. Transgenic Tools: Molecular genetics and breeding, gene insertion, expression and silencing, plant function, safety and regulatory affairs, over-expression analysis, biochemical and regulatory networks. Developmental Biology: Transgenic advancements, controls of physiology, formative studies, formative systems, farming, well being, mechanical and ecological advantages, enhanced sustenance, bio-fuels and bio-materials. Post harvest technology: Lessening of misfortunes in taking care of, bundling, transportation and capacity with cutting edge foundation apparatus, designing, displaying, propelled innovation and financial aspects. Microbial biotechnology: Microbial and plant biotechnology and physiology, microbial and plant hereditary qualities, sub-atomic science, horticulture and sustenance science and natural chemistry, nourishment control, assessment and handling in nourishment science, farming and ecological sciences. Tillage & Cultivation: Rural planning of the soil, Physical Properties of Soil, Chemical Properties of Soil, Biological Properties of Soil, Soil Organic Matter, Salt Affected Soils, and Tillage. Rainwater harvesting: Soil Erosion, Water Erosion, Wind Erosion, Soil and Water Conservation Measure. Irrigation: Frameworks of Irrigation, Soil – Water Relationships, Plant – Water Relationship, Transpiration, Water Requirements of Crops, Measurement of Irrigation Water, Scheduling Irrigation, Methods of Irrigation, Irrigation and Water Use Efficiency, Irrigation Practices for Major Crops, Quality of Irrigation Water, Drainage, Cropping Pattern in Command Areas, Pricing Irrigation Water. Weed Management: Comprehension of Common Weeds, Losses and Benefits, Weed Ecology and Classification, Crop – Weed Association and Competition, Methods of Weed Control, Classification of Herbicides, Herbicide Formulation, Herbicide Application, Absorption and Translocation of Herbicides, Mode of activity of Herbicide, Selectivity of Herbicide, Herbicide Combination, Rotations and Interactions, Persistence of Herbicides in Soils, Herbicide Resistance, Chemical Weed Control in Different Crops, Parasitic and Aquatic Weed Control.